MIGUEL Angel Jimenez has set his sights on being on Darren Clarke’s team after losing out to the former Open champion in the battle to be Europe’s next Ryder Cup captain. The Spaniard will be close to 53 when the match at Hazeltine comes around next September but sees no reason why he can’t make the European side for a fifth time. “To me the Ryder Cup is very important and I will always want to be involved in it in some way,” said Jimenez after carding a one-under-par 71 in the opening round of the Hero Indian Open in New Delhi. Clarke was selected ahead of both Jimenez and Dane Thomas Bjorn by a five-man panel that included the three most recent European captains. “I am very happy for Darren,” added Jimenez. “He deserves to be the Ryder Cup captain as much as I do. I would love to do it one day but I am happy for Darren because he has done a lot for the Tour as well. Jimenez was sitting just outside the top 20 in India, where SSP Chawrasia continued his excellent record in European Tour events on home soil to claim a share of the first-round lead. Both of the 36-year-old’s previous European Tour wins came in India, and a flawless 66 saw Chawrasia again setting the pace alongside playing partner and in-form Canadian Richard T Lee, Bangladeshi Siddikur Rahman, Sweden’s Joakim Lagergren and Chapchai Nirat of Thailand. 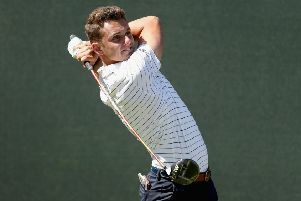 Craig Lee, the sole Scot in the field, opened with a 73 – a mixed bag containing two double-bogeys, three bogeys and five birdies – to sit joint-80th. In his first outing as Ryder Cup captain, Clarke carded a level-par 72 in the first round of the Dimension Data Pro-Am, a Southern African Sunshine Tour event at Fancourt. As three South Africans, including George Coetzee, set the pace with 66s, Scott Henry was the top Scot on 71, followed by Amateur champion Bradley Neil with a 73.